To all those Mamas out there who are going through any sort of sleep issues with their babies OMG you guys I TOTALLY hear you!!! One quick google search on “baby” and “sleep” and you quickly realize you are NOT alone. Here is what bothers me about googling baby sleep problems… EVERYTHING! I’m finally writing a post on our nap drama simply to make other Moms feel better, if anything at all. Also, I am somehow just realizing that a lot of Moms that seem to have had similar issues have all been with breastfed babies as well. Apparently sleep training a breastfed baby is very different than sleep training a strictly bottle or formula fed baby. WOULD HAVE BEEN NICE TO KNOW! Somehow all of my google searches missed this part. I will start by saying that we have literally tried EVERY method out there. AND we hired a sleep trainer. 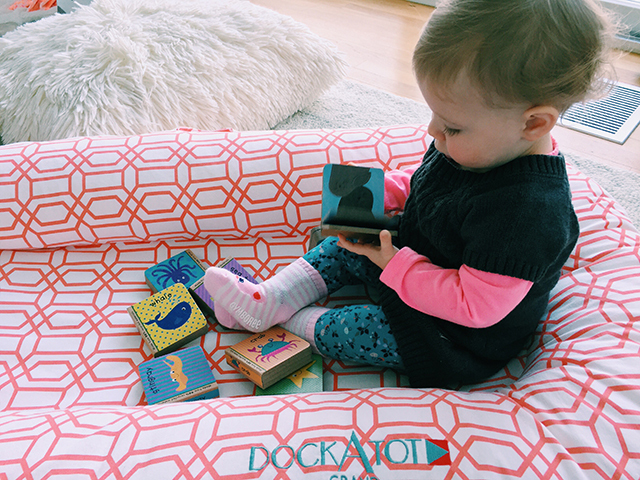 AND we bought a dockatot when that didn’t work (more on that later). So lots of time and money and tears (mostly from me) later, here is what has worked for us. 1. Time. 2. Weaning. 3. Having someone else that can help! OK, you can move onto the next article, post or forum about sleep if you don’t want to hear that just giving it time is a possible answer. Believe me, I’ve been there. OR you can keep reading and hear my story for whatever it’s worth. At around 6 months Sydney was still being breastfed to sleep. I would try and put her down (anywhere) and she’d wake immediately. So I kept holding her. The only way she would sleep during the day was in my arms, in the carrier or in the car or stroller. NOT ideal. In fact, awful! I couldn’t DO anything. And I was tired and feeling trapped and anxious just holding her and looking around at all the things that needed to be done! At night she would go down vie a 45 minute ordeal with lots of tears and coaxing and picking up and putting down and finally to sleep around 8 or 8:30. She’d wake a few times randomly but would go back down fairly easily and/or sleep until around 6. 8-6 = NOT ENOUGH SLEEP! I have to be honest, our schedule was ALL over the place. My number one mistake was letting her lead in the schedule making. As a first time Mom I literally had no clue what I was doing. So I googled and I worked out the below schedule for our sleep goals. This wasn’t perfect but it was a goal. We struggled a while longer and finally broke down and hired a sleep consultant. Cha-ching! I am convinced that sleep consultants thrive on over-tired and desperate parents. I mean, we would do ANYTHING to get her to sleep better. The sleep consultant helped us track Sydney’s sleep and got our schedule together. She wanted us to shift her first nap to earlier, which we tried but she went down easier with more wake time in the morning. So, we met in the middle. We talked on the phone and via email and it wasn’t ideal. And when our time with the sleep consultant was up we decided not to continue for more money because we’d already invested a lot and it still wasn’t working. Here were out main problems: Sydney would take 30-45 minutes to go down for a nap in her crib and she would sleep for 30-45 minutes MAX. I was putting in as much time to get her to sleep as she would sleep. She would cry immediately as soon as she went in the crib. When I held her she would sleep 1.5 to 2 hours. Yea, crazy! Who holds a baby for 2 hours twice a day??? Agh, I’m cringing as I write this. We sleep-trained for a long time. I would pick up/put down. Then I transitioned to crib-side soothing. Then I transitioned to intervals going in/out of the room. Finally we landed on intervals with soothing by the crib. To be honest, for a while in the middle of all this I was still rocking her to sleep while holding her then laying her in the crib. She’d sleep 45 minutes twice a day and I was fine with it. But it didn’t last. I knew it wouldn’t last and I knew that in order for her to nap well (if at all) she needed to go into her crib fully awake. But when you find some solution that gets your baby to sleep at all and it works you get lazy or just desperate and you go with it. WRONG! I will note that Sydney has slept through the night fairly consistently with little or no wakings from 6 months on which was a complete blessing. It was also confusing to us – why would she go down so well at night? If she woke at night she’d generally cry for a second, find a new position and put herself back to sleep. WHY couldn’t she do this during the day?! I will say that the one thing our sleep consultant did for us was to give us the confidence to take the lead and help us feel OK in letting her cry a little. Our sleep consultant told us that unless Sydney started putting herself to sleep, anything we tried wasn’t going to last. So she was right, it was just figuring out the method that took a LOT of time and in the world of sleep consultants time = more money. It was frustrating to say the least. OH you haven’t made much progress in two weeks, for $150 more we can keep emailing for another week. Insert crying face emoji here! She also suggested that we try switching her to one nap a day… at 9.5 months old?! Now I felt like she was grasping at straws. That was when we decided to end our consulting for good, take what we had learned and move on. So, fast forward to 12 months. I weaned Sydney. She was fully weaned from her day feedings, her night feeding and was breastfed only once in the morning when she woke up. I would pump and bottle feed her for all of her feedings except that first feeding in the morning and I started supplementing her breastmilk with formula because my supply was getting low. I was no longer anxious about not producing enough milk and Syd wasn’t dependent on being breastfed. I now believe that weaning was the number one solution to our problem. Sydney could not learn to put herself to sleep on her own until she was fully weaned because she’d been falling asleep at the breast for the first 6+ months of her life. So, this was not her fault but ours. This took TIME but it was time. Haha see what I did there? Ok, moving on. 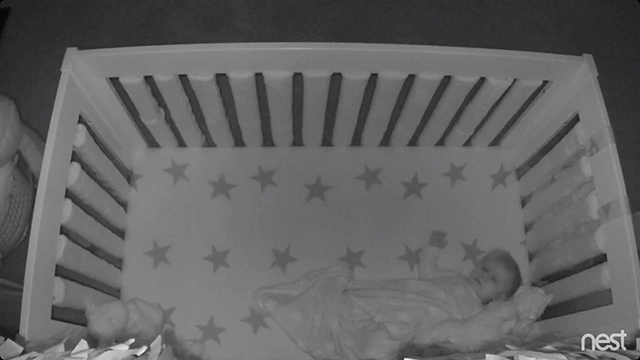 We taught her to go into her crib FULLY awake by sheer will. I’d put her in her crib and no matter how much she cried or screamed I would NOT take her back out of her crib. I’d simply stay by her side, lay her back down and tell her it’s ok, rub her back and sing her songs. Eventually she got the hint and would lay down and go to sleep. She had “kitty” whom she would sleep and cuddle with. And, finally she was going into her crib fully awake for naps with some soothing, very little crying and getting herself to sleep within 5-10 minutes. This took months to perfect. We were FINALLY winning! NOT. Now she would wake after 23 minutes EVERY SINGLE NAP. So with 46 minutes of total sleep a day, we still had problems. I kid you not I was beside myself. I was completely defeated. I have very vivid memories going into my bedroom and crying into my pillow feeling SO completely helpless. I would text my husband that I was an awful Mom and I clearly didn’t know what I was doing. Here is where we bought a dockatot. Money money money money. MONEY! Ha, remember that part where desperate parents will do anything to get their kids to sleep?! I had a dockatot on my mind forever but couldn’t convince myself or my husband that it was worth the investment. Until the 20-minute nap phase. Babe we’ve conquered everything. She’s going into her crib on her own, laying down and falling asleep then WAKING UP, but why?! So we thought maybe a dockatot would help her feel less exposed in the crib, more like she was being held for her naps. I don’t know. We purchased it and she slept in it but it made no difference in her sleep time. She’d still pop up after 20 minutes and be upset. She loves playing in her dock during the day. She climbs in and brings her books and stuffed animals and rolls around in it. I am hoping that when we transition her to a toddler bed it will help in that phase but for now, it sits in her room or our living room for quiet play time and every time I look at the damn thing it pisses me off. One more try that didn’t work. Honestly though I think if we had gotten the smaller version when she was an infant it would have been great. If you go to the site it gets stellar reviews. It just didn’t work for us the way we were hoping it to. Sometimes Sydney still wakes at the 45 minute mark. I’ll go in and try to get her to sleep through. Sometimes it works, sometimes it doesn’t. I am fully convinced that she simply doesn’t need 3 hours of sleep during the day. I WISH she slept for 3 hours during the day… or even 2 but the max we get around here is now 1.5. She is completely happy with 45 minutes to an hour of sleep. I don’t know how she runs on that because according to all of the internet she’s supposed to be getting a minimum of 2 hours during the day. But she’s seriously happy. She wakes up and laughs and plays and runs around and dances and gives kisses and hugs and if she’s happy, I’m happy. Shifting her bedtime sleep was one of the best things we’ve done. She started getting an hour more of sleep so it was a win for us all. One nap a day is SO much easier. I would dread having to put Sydney down for a second nap. It was just exhausting. I had to plan the entire day around being back in time. Now we have all morning and all afternoon to do what we need to with a nice little break in the middle. Here is where I say that this is OUR experience and I certainly can’t give advice on what to do because my baby only sleeps for an hour, why would you ever listen to me?! But seriously, in the world of mama-hood the thing that I will leave you with is that you are NOT alone!! There are other parents going through the exact same thing as you and if this post does anything I hope it makes you feel better about your scenario. The one piece of advice I will say is that when you are at the end of your rope, get help! We have an amazing sitter who is with us three days a week. She helped us with Sydney’s naps and helped us feel like we weren’t crazy. My Mom and Dad would come over and help if/when we just needed a break. When it comes to sleep it’s NO JOKE. You will feel like a crazy person if you don’t sleep and you won’t be able to help your baby sleep if you don’t sleep so ask family/friends/neighbors for help and accept it when they offer. It takes a village! And at the end of the day a glass of wine won’t hurt either.